An Port is a breathtakingly beautiful bay in one of the most remote locations on mainland Ireland. It lives at the end of a winding 20 kilometre single track laneway and is the gateway to Ireland’s last wilderness. Living along this coast are a huge collection of outrageous sea stacks and very remote sea cliffs. 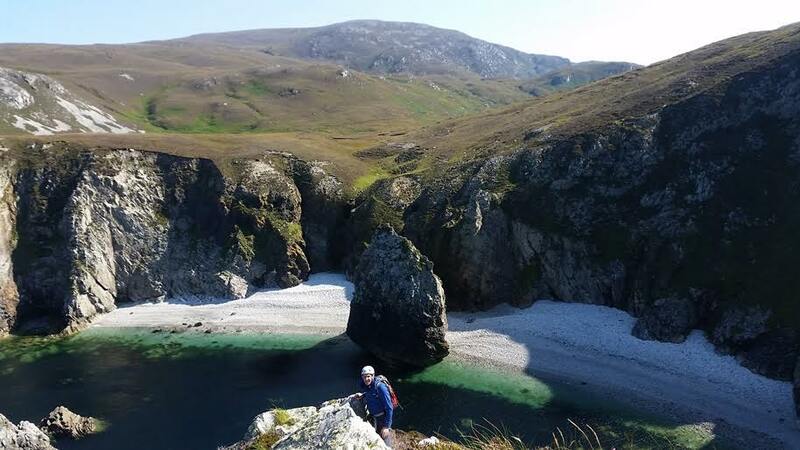 This article details a selection of outstanding and in some cases, world class rock climbs, view points and Irish seascape found along this very isolated coastline. By following the cliff top path north east from An Port road end for three kilometres will take you to a view point overlooking Glenlough Bay. This bay stretches for 2 kilometres from Tormore Island at it’s southern end to the End’s of the Earth Stack at it’s northern end. Glenlough Bay contains one of the largest raised shingle storm beaches in Ireland and on a day of huge north west sea motion the roar of several million tonnes of shingle being moved up and down the beach by the incoming seas can be deafening even from the cliff tops over 300 metres above the beach. This 1 kilometre long raised shingle storm beach is very effectively guarded from all sides by steep sided 250 meter high slopes of scree and cliffs and from the sea by the huge north Altantic swell. Glenlough contains a vast amount of excellent, if a little adventurous rock climbing. 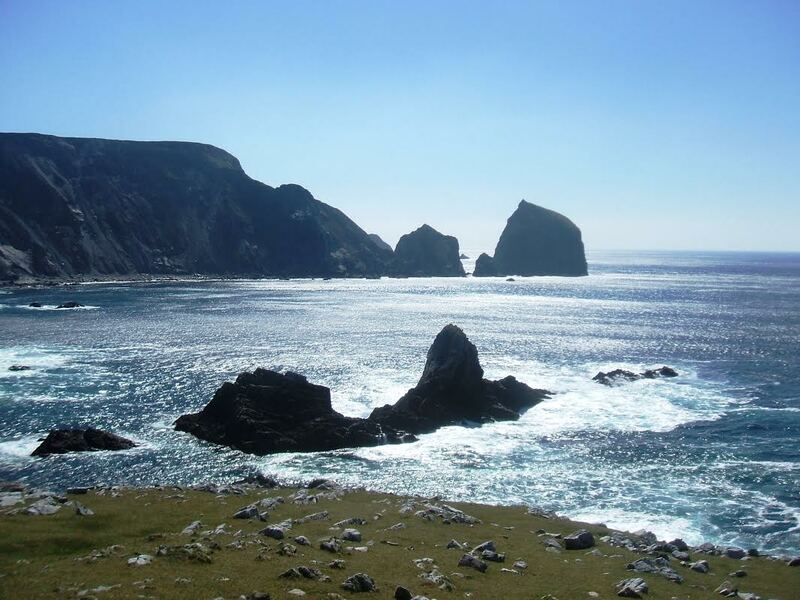 At the southern end of the bay sits Tormore Island at 148 metres at its summit, this is Ireland’s highest sea stack. This huge square topped stack can be seen for many kilometres along the coast either side of it. It can even be clearly seen from the Dungloe/Kincaslough road some 40 kilometers to the north. In the centre of the bay a further three huge sea stacks sits. Each of these three sea stack present a very different mountaineering challenge for the aspiring summiteers. By far the hardest and potentially the most dangerous of these climbs is the most northerly tower named Jenga Tower and for anyone who has played Jenga, you will get the idea of the rock quality on the sea stack. Running along the north wall of Glenlough is the aptly named “The End’s of the Earth Crag,” this cliff is a contender for most remote rock climbing location in Ireland and provides excellent slab climbing in a truly mind blowing location above a huge sea level blowhole. Guarding the northern end of the bay is the lonely End’s of the Earth Stack, This 25 metre high sea stack sits in one of the most beautiful and remote locations in Ireland. It sits 300m out to sea from the lonely wee bay to the north of Glenlough. To the south you have the vast expanse of Glenlough Bay continuing south along the West coast to Tormore Island and to the east you have the vast expanse of the north coast of the Slievetooey Peninsula. Its location ensures it attracts the confliction tidal streams from both the south and north west causing a colossal amount of white water violence in the bay surrounding the base of the stack and standing on its summit is a moment you will remember for a very long time. Iain miller is a rock climber and hill walker living working and playing in Co Donegal in the north west of Ireland. His website is http://www.uniqueascent.ie and it details over 100 climbing locations and a shade under 3000 rock climbs throughout Co Donegal.